It's easy to chat up the visible products - lip gloss and a dreamy bronzer come to mind. 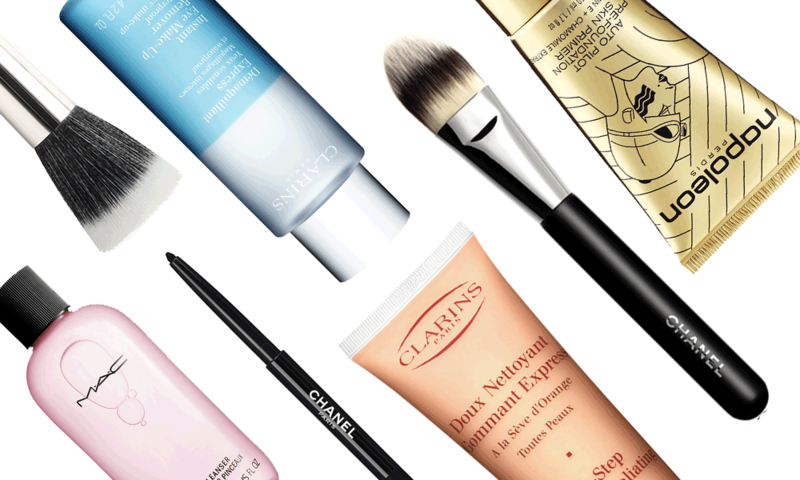 But what about the workhorses in my beauty routine? What love am I giving the makeup remover that erases that Angelina-worthy cat eye eyeliner or the foundation brush that made me a convert? It's time to give those items a round of applause and (hopefully) give you a few new items to solve some of life's nagging beauty issues. First up: my cleanser. I've mentioned it before, but it's worth repeating. Clarins's One-Step Gentle Cleanser IS AMAZING. I have combination skin with drier cheeks than my dewy t-zone. I would also classify my skin as sensitive, since one brush with an irritating product seems to wreak havoc on my face. But this dreamy cleanser-exfoliant combo is a MUST. Gentle enough to use regularly, I love how smooth my face is after use but how it also doesn't feel stripped of those essential natural oils. Did I mention it smells lightly of oranges? I just love this stuff. I hope this is never discontinued. Next, a pair that goes hand in hand: Chanel Waterproof Eyeliner in Noir Intense is a black that is actually black. Not charcoal. Not blue. Not brown. But black. It's the liner I've looked for my entire life. That said, you'll need help removing it. Clarins saves the day with their Instant Eye Makeup Remover, a beauty blogger favorite. Lauded for it's eraser-like qualities, one swipe of a properly soaked cotton swab and those raccoon eyes are a thing of the past. Like a home, a finished face is only as good as the foundation upon which it is built. Admittedly I have never been a primer girl. I've tried. I've also politely tossed all of those lovely samples in my "rainy day" drawer in case I ever changed my mind. Perhaps it's the odd Dallas climate (mostly dry with severe temperature swings and just enough humidity to mess up your makeup), but I'm suddenly in need of a base. Thankfully I've found my solution in a pretty little gold tube. Napoleon Perdis "Auto-Pilot" Primer does more than just coat the skin, it treats it with moisture via a lovely dose of chamomile and Vitamin E. The result? A face ready to let your tinted moisturizer or foundation actually "take" and last without ever feeling like a mask. I finally see the light and "get it" with primers. This fabulous product and I am SO happy to be a convert. Now... on to a few brushes I adore. First is a Laura Mercier stippling brush. I happen to use it for my bronzing powder mainly, but periodically use it to deliver a feather light dusting of finishing powder on my face. Like primer, I'm not normally a powder girl, but as you now know Charlotte Tilbury has changed my perspective on powders and their miraculous air brushing effect. It's been a personal favorite for several years. I may give the Chanel one a go here soon, as it has a serious fan base. Now let's talk foundation brushes. Here's where it gets fun. I know the beauty blender is allllll the rage. I just don't get it. Not a fan and I prefer either fingertips (messy but marvelous) or Chanel's Foundation Brush #6. Obviously this depends upon the type of foundation you use. I tend to wear creamy liquid varieties. A more versatile option is Chanel's Foundation Brush #7, designed to handle cream, powder or liquid formulas. It's a versatile wonder product and it is next on my list to acquire. Let's face it. Brushes aren't cheap but they are worth every bit of their investment as long as you care for them properly. Clean them religiously with a proper cleanser (MAC still offers one of the best) and keep them in a case or in a dedicated area where the bristles won't get bent and damaged.